We are thrilled to welcome four new Bread Angels! New microbakers - flying the nest! 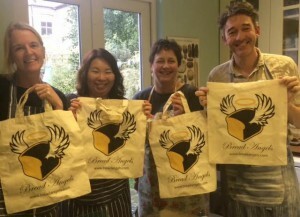 Alex, Utako, Debbie, and Lawrence recently completed the microbakery course and are now in the early stages of setting up their own micro bakeries. We cannot wait! We wish them luck and happy baking on their new ventures! Click here to take the microbakery course! You can do what you love, earn some money, and strengthen your local community.